Brightline has published an excellent set of 10 guiding principles to bridge the ubiquitous gap between strategy design and delivery, and I think it should be required reading for all leaders. The Brightline Initiative™ is a coalition of leading global organizations assembled by the Project Management Institute (PMI), dedicated to, in their words, "helping executives bridge the expensive and unproductive gap between strategy design and delivery." I'm particularly pleased that that they recognized the importance of resource planning in their list of 10 key guiding principles, particularly on points 3 and 8. To build on this, part of resource planning is determining and prioritizing the various aspects of the business and aligning the right resources accordingly. A general rule of thumb is to give "running the business" the minimum effective amount of resources it needs (not shortchanging it, however, lest it become a critical issue) and giving the "change the business" initiatives the maximum effective resources, even applying a concentration of force where appropriate to strategic programs (to use an age-old military principle). Again, these are general guidelines, not unilateral rules. This gets to the heart of resource planning: assessing capacity and keeping the existing portfolio in mind whenever considering new initiatives. It's possible that shifting resources, shifting projects, or seeking alternate sourcing may be required. In any case, potential capacity issues shouldn't be ignored, as many companies are prone to do. It's great to see these oft-forgotten principles recognized as key elements of the strategy execution process. They also promote other principles I've always touted, including simplicity, engagement, and cross-business cooperation, I highly encourage reading the full list and sharing it with others in your organization. In this informative 7-minute video from Harvard Business Review titled "Why Strategy Execution Unravels--And What To Do About It," three cornerstones of successful execution are discussed, as well as five common myths. 1) Coordination - Coordinating across business units, keeping key information clear and simple (and make sure your systems support cross-business unit management as well). The video offers a smart reminder that execution should not be top down, but should be driven from middle managers closest to the action, with general guidance from the top. This is where the crisp, simple messaging is vital. I couldn't agree more regarding all of this. Having a clearly communicated set of strategies and business priorities that are coordinated across the business; being adaptive to change through regular portfolio reviews and adaptive delivery methods; and regularly reallocating resources and funds based on priorities are all crucial to successful strategy execution. These principles are what we've been preaching at PDWare for some time now and what I've been writing about for ages, so it's great to see it so well articulated in this insightful video. As HBR reports, 75% of organizations struggle to implement strategy. I'd venture to say it's because they're not paying attention to cross-business coordination, execution agility, and regular reallocation. One telling statistic highlighted is that only 16% of team leaders and frontline supervisors feel they have a good grasp of how priorities fit together. This is because communication is often focused on quantity over quality and dilutes the message with too many elements. An example in the video depicted a company trying to communicate a message with dozens of objectives, values, priorities, competencies, and new terms. Who's going to remember all that let alone care about it? Another mistake is an over-focus on hitting the numbers vs. compelling messages and rewards that actually drive behavior. Sadly, I've seen all of this in far too many organizations. For those seeking to better execute on strategy, viewing the video will be 7 minutes well spent. 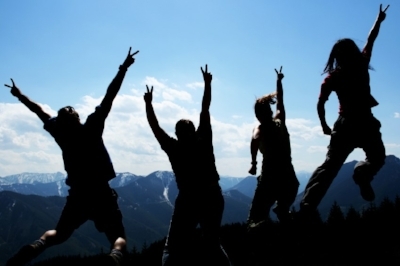 Are You Leveraging Your Team's Strengths? 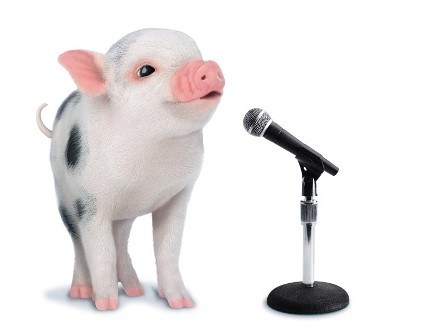 Robert Heinlein said, "Never try to teach a pig to sing. It wastes your time and annoys the pig." It's wise advise. So why do so many organizations keep trying to do this to their teams? How many of you have seen this: Accidental project managers who are great subject matter experts, but don't know a thing about influencing people or bringing a project home; Excellent technicians who can't relate to human beings but yet are thrown in customer relationship-heavy positions; Leaders who don't in any way, shape, or form belong leading people, but who were put there because they were good "doers" (aka the Peter Principle). How much time is wasted coaching and training in attempts to fix people's weaknesses instead of amplifying their strengths? I was once asked by a client to help their best technical person, a real workhorse, become more customer-friendly. It was apparently causing him and the team frustration when customers complained. I said, "Why on earth would you want to do that? He is who he is, which happens to be a superstar technician. Better to pair him with someone who IS customer-friendly." Fortunately, they had someone in mind (once they freed her up from some activities that weren't in her area of expertise) and it worked wonders. Having team members work against their strengths creates what I'd call "negative flow," counteracting any resource productivity improvements. If Flow (as its conceptual creator Mihaly Csikszentmihalyi defines it) is about finding the optimal balance of applied skill and challenge, having people work against their strengths (negative flow) creates friction and resistance, slowing team progress along the way. This is very much a resource planning and productivity issue, yet is often overlooked as such. One colleague in the positive psychology movement compared it to bringing in a pitching coach to strengthen the left arm of a right-handed baseball pitcher. It's fruitless. Likewise, Tom Peters once lamented that you don't take a first violinist in an orchestra and automatically say, "He's so good, let's make him conductor!" yet companies do the equivalent all the time. You can learn "stuff." Attitude and natural strengths, not so much. Fortunately, there are tools for assessing your natural strengths. Perhaps the best known is the CliftonStrengths Assessment (formerly called Strengthsfinder) from Gallup, made popular in Marcus Buckingham's books, which I highly recommend. Perhaps Peter Drucker said it best when he said, "The task of leadership is to create an alignment of strengths in ways that make weaknesses irrelevant." Knowing this, think about your teams. What are some ways you can pair or augment strengths that can make their weaknesses irrelevant? It can be a tricky puzzle, but it beats the alternative. WEBINAR ANNOUNCEMENT: Join me and PDWare CTO Paul Samarel this Thursday, June 28 at 11am EST for a one hour FREE Webinar on Strategy Execution. CLICK HERE TO REGISTER. Distributed Versus Co-Located Teams: Which is Best? The title to this post is a bit of a trick question. When it comes to building camaraderie, boosting productivity, and gaining clarity, there's nothing like being in the same location and having face-to-face communication. However, there's more to team effectiveness, such as work style flexibility, autonomy, and cost efficiency. Moreover, working virtually, at least part of the time, is increasingly an expectation in today's digital world, so employee satisfaction and retention is a consideration. The question of which is best, therefore, is misleading and falls short. Both have advantages and disadvantages. The best solution is usually to combine both, having periodic face-to-face meetings, especially at the beginning of major initiatives or at crucial points, and at least yearly. There are exceptions of course, depending on your industry and culture, but it's worth considering the advantages of a combined approach. I recall being on the leadership team for the Project Management Institute's standards for program and portfolio management (First Editions) a number of years ago. We had to lead over two hundred volunteers in a multi-year program. The leadership team and several sub-teams met face-to-face a couple times during that period. With each face-to-face meeting, we noticed a marked improvement in clarity and productivity, and the first one alone boosted camaraderie immensely. Yet, working virtually most of the time was quite effective and productive. This article in Harvard Business Review on Combining Virtual and Face-to-Face Work offers a concise overview of the benefits of working virtually and face-to-face, and provides sound approaches for combining the two. It's not a bad guide to follow. For more on virtual teams, see my post from a few weeks ago on Finding a Balance with Virtual Teams. Whether it's conversations about strategy and priority, conversations about staffing and resource planning, or conversations about project needs, the greatest enabler of getting things done is... you guessed it... conversations. The best systems in the world won't make up for a lack of communication. But, as George Bernard Shaw said, "The single biggest problem in communication is the illusion that it has taken place." The right kind of communication requires what my good friend and leadership guru Judith E. Glaser calls Conversational Intellience, or C-IQ, which is the subject of her landmark book, Conversational Intelligence: How Great Leaders Build Trust and Get Extraordinary Results. Transactional Conversation -- in which the goal is to INFORM, and at best seek give and take. Positional Conversation -- in which the goal is to PERSUADE, and at best seek a win-win. Transformational Conversation -- in which the goal is to CO-CREATE, engaging in a mutual exchange of ideas. Simplicity Gets Things Done. Plain and Simple. Artist Hans Hofmann said, "The ability to simplify means to eliminate the unnecessary so that the necessary may speak." I've always found that to be such a profound and brilliant statement that applies across a plethora of areas. 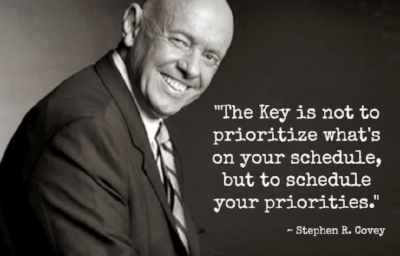 Certainly it applies to portfolio management, where a focus on key priorities will drive greater results. It also applies to process, where 20% of the standards will usually bring about 80% of the improvements. Without a doubt, it applies to communication, where saying many things communicates nothing. And I suppose it applies to art as well, in all its forms. 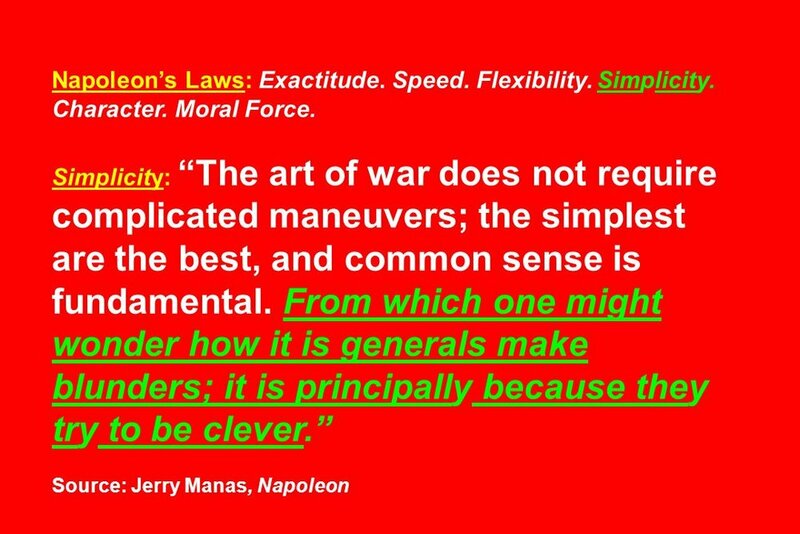 Simplicity happened to be one of Napoleon Bonaparte's "six winning principles" that I highlighted in Napoleon on Project Management. In fact, management guru Tom Peters ("In Search of Excellence") picked up on it and often shares the below quote from Napoleon in his presentations, along with one or two others. I think Napoleon and Hans Hofmann would've gotten along quite well. 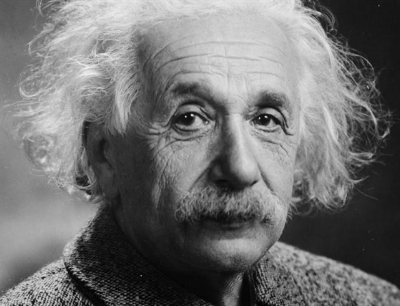 Bottom Line: Simplicity and focus go hand in hand, and whether you're implementing a process, configuring a system, or communicating a change, remember to K.I.S.S ("Keep it Simple Stupid"). More and more, organizations are planning and working in teams. That's an important fact to remember when talking about resource productivity and planning. Yes, heroes can and do save the day (and that's just fine. As Michael Jordan said, "There's no 'I' in team but there is in win."). And yes, the "I"s in the team are just as important to nurture as the "We." But there's no doubt that having a great team culture can boost individual productivity and happiness, and improve the overall culture of the organization. Team escalations - The more the team escalates issues, the less effectively they're operating as an empowered, decision-making team. Finding the influencers - The influencers in an organization aren't necessarily in management positions. Identify them and make sure there's vision alignment. Get their input in shaping the culture. Rewarding the right behaviors - Be careful what attributes you may be subconsciously (or consciously) rewarding. Note: I'd add that it's a good idea to use team rewards to build a shared sense of commitment, while rewarding and encouraging individual behaviors as well. Just be careful to craft individual incentives that are counterproductive to team performance. It's often more an art than a science, so it's important to look at things in the context of both the team and the individuals. Watch Your language - Using the right vocabulary can make all the difference in a team's culture. Using words like "compliance," "mandatory," "headcount," etc., can set a certain tone, and it's not a good one. So can phrases like, "No, that'll never work" or "We've always done it this way." Likewise, Nuhring points out that it's not just language, but interaction and demeanor that you need to observe. Is there a sense of empathy on your team? Are people having fun? Do they feel comfortable sharing ideas? I'd add that language can often influence this. Fix One Thing at a Time - Find out what the one thing is that's holding your team back culture-wise and focus on that. Then you can move on to the next thing. Maximizing resources isn't just about putting the right people on the right work at the right time. It's about harnessing the collective strength of your people. And in today's world, that means leveraging virtual and remote teams effectively. In the recent CIO article "How to Lead a Virtual Team: 5 Keys for Success," author Josh Fruhlinger points out the need to boost communication with remote teams; document team agreements and action items; balance autonomy and connectedness; break into small teams where possible; and last, but not least, to never let "out of sight" be "out of mind." This is sound advice for sure. Finding the right balance in making sure remote team members feel included but not micromanaged is vital to success. Likewise, in the sea of new collaboration technology, it's all too easy for decisions and information to get "lost in space" -- along with the remote workers themselves. Fans of the Lost in Space sci-fi series will no doubt be familiar with the robot's battle cry, "Danger, Will Robinson!" That's also what you should be thinking if your remote team members aren't being kept in the loop, or worse, are feeling micromanaged. Side Note: As a sci-fi author (in my other life), I'm a guest and speaker at lots of pop culture conventions. It just so happens I spent the weekend with a couple of wonderful Lost in Space actors, Marta Kristen (Judy) and Mark Goddard (Don West) at a show in Delaware. You never know where inspiration can come from! Anyway, here's the thing. In today's world, millennials and other employees expect to work remotely, at least part of the time. Mergers, acquisitions, offshoring, and global expansion mean teams may be scattered all over. Even Agile teams, for which co-location is a founding principle, are now adapting to using technology for boosting virtual collaboration where necessary. Engagement -- How can remote people remain engaged while also being trusted to operated freely and independently? Governance -- How can guiding themes and principles ensure consistency, while allowing for local needs and personal creativity? Technology -- How can collaboration technology serve as an enabler without overloading people with too many tools to use or making them feel micromanaged? Mastering these areas is more of an art than a science, and what works for one team member may not work for another. Preferences could be location or culture-dependent as well. That's where good old candid communication comes in handy, talking to people about their desires and needs. Similarly, you don't want to burden remote team members with constant standard recurring meetings. I see this all the time as a weak substitute for good team collaboration. Again, some team members might prefer it. Some will see it as an annoyance. Meanwhile, I'd challenge leaders to find ways to keep people in the loop and engaged while minimizing recurring meetings, though some may be needed for specific projects. Or make the meetings monthly, with ongoing collaboration in between. Again, this is more an art than a science, and can vary with each team member. One last bit of advice. Always try to plan a face-to-face gathering, ideally at least quarterly, but no less frequently than yearly. Every virtual team I've come across touted huge boosts in belonging and engagement after each face-to-face meeting. A face-to-face meeting can go a long way. Whichever approaches you settle on, just remember author Mark Sanborn's words, "In teamwork, silence isn't golden, it's deadly," That's when it's time to say, "Danger, Will Robinson!" Effective project estimates and resource planning are indelibly linked. After all, if the estimates are wrong, it'll skew your resource plans. And if resource planning isn't done, it'll skew your estimates because people may be overloaded, causing everything to take longer. In this PM Times article on improving project estimates, author Rich Butkevic points out common estimating fallacies, such as assuming nothing will go wrong, attempting to estimate tasks in a vacuum, and underestimating due to faulty assumptions based on prior projects. Butkevic also highlights a number of factors when making estimates, including project dependencies; past performance of similar projects (with proper cautions about assumptions of course); necessary buffers and contingencies; third party availability; consulting the team on resource availability; and more. Of course resource planning can also help from the availability perspective. Bottom line: Next time you're thinking about resource planning processes, don't forget that sound estimating practices are a key success factor. And beware of Dilbert's boss. Visibility of resource capacity and demand isn't just important. It can be the difference between good decisions and bad ones. To use an analogy, assume you need to buy a car. You have your checkbook in hand, but you have no idea what's in your checking account. The optimist, who takes a chances and hopes the check won't bounce. The pessimist (or perhaps realist), who doesn't want to take a chance and forgoes buying the car. Both of these people can end up with bad outcomes. One may overextend their resources and the other may miss out on a car they very much need. It's the same with organizational resource capacity. If you don't have a good picture of the complete set of demand that your people are faced with, how can you really know which projects you can afford to take on? Maybe you'll take on too many projects, overloading your staff and causing excessive delays. It's been known to happen. Or maybe you'll decline a potentially valuable project that you just might have been able to staff using untapped skills in your organization. It all boils down to a simple question. Do you feel lucky? Or would you rather know for sure? To avoid the Dirty Harry "Do you feel lucky" approach to project intake, be sure to have a prioritized inventory of your projects, an inventory of your people resources and their capacity, and at least a high level effort forecast of who's scheduled to work on which projects and when. Equipped with better information, you'll find yourself getting luckier by the day. Are You Sabotaging Your Resource Planning Efforts with Poor Talent Management? You can have the best resource planning processes and systems in the world, but if you have the wrong people in the wrong roles, you're sabotaging yourself. Likewise, you need to be staffed with the future in mind to remain agile and adaptive. This is especially true in management and leadership positions. This Forbes article on solving the big talent problem gets it right. Hire for soft skills, particularly curiosity. People who are eager learners and socially adept will shine regardless of how much technology and skill needs change in the not-so-distant future. "Stuff" can usually be taught. Behavioral traits, not so much. There are of course exceptions for specialized knowledge workers, but that in itself doesn't qualify them to manage people. As management guru Tom Peters likes to point out, an orchestra doesn't say, "Hey, he's so great as first violinist, let's make him conductor!" In baseball, having been a great third baseman doesn't qualify you to be a great manager. So why do we do this all the time in business? The Peter Principle is alive and well as we regularly promote people to their highest level of incompetence. Bottom line. If you want to really maximize your resources, you have to get the "people" part right.